If you've never heard of F2 Wedges (or any of their clubs, for that matter) don't feel too badly -- neither had I. So, time to do some digging and find out what F2 -- for Face Forward -- is all about. With innovations in golf club equipment happening nearly as fast as computer chips shrink and your cell phone goes out of style, it makes sense that wedge technology would be keeping pace as well. However, that hasn't really been the case as wedges have remained pretty true to form for the past 20-30 years. The biggest innovations have come in the area of "pro grinds" to the sole, and the creation of a four-way bevel on the sole for more flexibility in shot-making. F2 has set out to change that by moving the face forward of the hosel. We've all seen offset hosels -- where the hosel is set in front of the leading edge of the club, to a greater or lesser degree. Offset is generally built into clubs to promote getting the ball airborne more quickly and easily. F2's innovation of moving the face ahead of the hosel is designed with the idea that the ball is struck -- and leaves the clubface -- long before grass or sand can grab the hosel and twist the clubhead, resulting in poor contact and offline shots. From most angles, the F2 wedges look a lot like a rattlesnake hook. But, from the important angle -- looking down on it from the user standpoint -- it looks pretty much like any wedge you've ever used. The rather unique dog-leg hosel allows for the face forward design without radically changing the golfer's perception. The F2 wedges are currently available in Right hand orientation only, but left hand versions are in the works and will be available soon, according to the F2 website. Wedge models feature a cavity back design with USGA legal grooves and include lofts of 52, 56, 60 and 64 degrees, and of course all feature the face forward design. Shaft options are either steel or graphite, though shaft specifications were not available as of this writing. While I would often make a suggestion for comparison(s) in another wedge, there is really nothing like the F2 to compare to. If you're looking for some change in your wedge, then take a closer look at these F2 wedges. Perhaps they are right for your game. 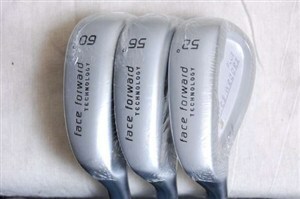 How do i adjust the lye for us shorter guys on the new face forward F-2 wedges?